Its well preserved old town marked by cobblestone backstreets and half-timbered houses is the first indication of St. Gallens' rich history and deeply rooted traditions. In the 19th century the city was blooming and all important decisions and discussions were undertaken in coffee houses while sipping on the everpresent caffè crema. "St. Gallen has lost its original café house culture", Gallus Hufenus regrets. He is the owner of Kaffeehaus, a unique café aiming to build a bridge between the traditional approach to coffee, influenced by dark Italian espresso roasts, and the third wave. Gallus, who is a former journalist, opened the roastery and coffee shop "Kaffeehaus" in 2010 after exploring the world of coffee as a writer in Buenos Aires and thereafter completing a number of barista courses. If you ask him about specialty coffee, he won't shy away from telling you that he has little interest in hipster coffee shops with minimalist, Nordic interior where sugar is hidden in a shame corner. "The world is becoming more and more homogeneous." he states, and when I look through my Instagram feed filled with pictures of coffee shops from around the world that all look similar I can't help but think he is right. A lot of specialty coffee shops could be located literary anywhere as they often lack an obvious connection with the city they are located in. When you step into Kaffeehaus, on the other hand, it does feel a bit like time travel. The interior takes you back to when "...people talked about the revolution instead of the extraction time for their espresso". Uniquely, at Kaffeehaus you'll find modern drinks such as nitro cold brew regardless of its traditional set up. "I wanted to interpret the traditional coffee culture anew and find an equilibrium between the two worlds. ", Gallus explains. All of his coffee is 80+ and sourced through direct trade - most of the farms he has visited personally. Kaffeehaus offers several single origins for filter and espresso, such as Colombia, Brazil, Peru and India. A Chemex sits on the shelf, even though filter coffee is ordered only roughly 3 times a year. "I hope that more people will find an entry to the world of specialty coffee and I enjoy to show them how multifaceted coffee really is." 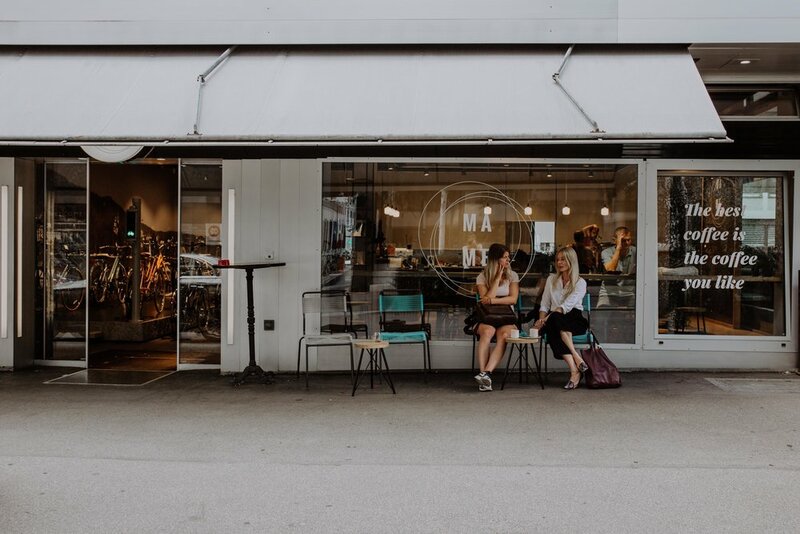 Since June 2017 St.Gallen has its very first third wave coffee shop, all thanks to Emil Underberg, who dared to open a completely new kind of café in his beloved hometown. "At the very beginning locals were sceptical", Emil says, who has studied Hotel and Hospitality Management in Australia. Fellow Barista Gallus was the first to show the people of St.Gallen that brewing coffee involves much more than merely pushing a button. He has paved the way for appreciating coffee for what it is: a bean full of flavours! At Barista- Specialty Coffee & Bar the Zurich based specialty coffee roastery Stoll Kaffee has found a permanent home, while the Erste Tegernseer Kaffeerösterei is currently occupying the guest hopper. Emil already knew 8 years ago that he wanted to open a coffee shop and is thoroughly in his element when weighing every single shot and trying to get the extraction perfectly right. Another speciality of the house are the homebaked cakes that are a work of art! Although filter coffee is rarely ordered, Aeropress, Chemex and V60 are available. "When St.Gallen is ready for it, we'll set up a little brewing station. ", says Emil. Until then he keeps on spreading the word about specialty coffee and makes his guests feel right at home. During my trip to St. Gallen I stayed at Militärkantine, a renovated military canteen built in the years 1901-1902 and located close to the historic center. It is the perfect combination of a historic building with contemporary design elements and comfort. The 21 spacious rooms, beautiful interior and delicious breakfast make this a great place to stay! Check for latest offers and availability here. This article is part of a series of coffee stories from Switzerland. St. Gallen-Bodensee Tourismus and Schweiz Tourismus have been amazing in supporting this project. You can find more information about tourism in St. Gallen at st.gallen-bodensee.ch and Switzerland at www.myswitzerland.com. Check out my other travel and coffee guides in Switzerland!